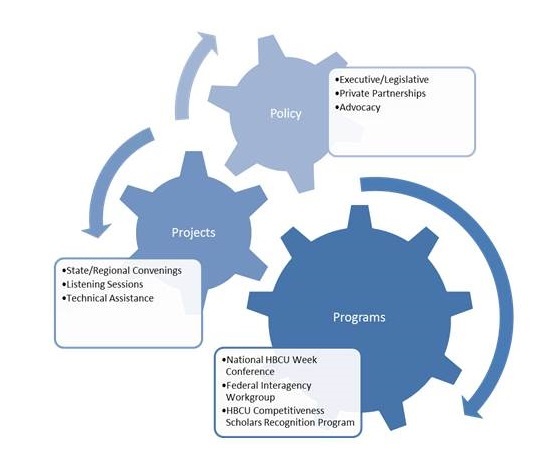 The Initiative shall work with agencies, private-sector employers, educational associations, philanthropic organizations, and other partners to increase the capacity and competitiveness of HBCUs to provide the highest-quality education to an increasing number of students. The Initiative is dedicated to helping HBCUs successfully compete for top opportunities in national and global markets while providing education and economic experiences that can improve the standards of living for the students and communities HBCUs primarily serve. Programs are embedded, ongoing and longer-term activities singularly owned by the Initiative that are generally singularly delivered by the Initiative, but can be collaboratively delivered with others. Projects are finite-duration, discretionary actions, often outside the Initiative’s, federal agencies’ or private sector actors’ day-to-day organizational activities; they are designed to accelerate the desired performance in a targeted area. These short-term efforts are generally jointly owned and delivered by the Initiative with others and act as boosters to accelerate HBCU competitiveness. Policies are influential actors’ written or oral expressions of important public objectives and priorities. These actors can be public sector (e.g., local, state and federal executive/ legislative/agency) or private sector (e.g., industry/philanthropy/education/advocacy).